Behistun Relief of Nidintu-Bêl. Label "This is Nidintu-Bêl. He lied, saying "I am Nebuchadnezzar, the son of Nabonidus. I am king of Babylon."" The Babylonians deriding Darius in 522 BC. 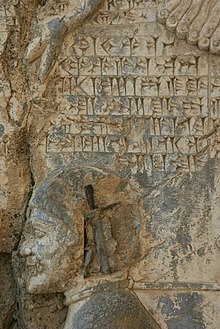 The Babylonians in their city deriding Darius. Behistun relief, Nidintu-Bel in chains. ^ Harvard University; G. P. Goold (1 January 1972). Harvard Studies in Classical Philology. Harvard University Press. pp. 112–. ISBN 978-0-674-37922-0. Retrieved 19 March 2012. ^ a b Tom Holland (12 June 2007). Persian Fire: The First World Empire and the Battle for the West. Random House Digital, Inc. pp. 46–. ISBN 978-0-307-27948-4. Retrieved 19 March 2012.